Adobe Captivate 5: You Can Capture Time... Really! You are recording a demonstration and you'd like to capture the amount of time a process takes. For instance, clicking a button in your application takes 7 seconds for the process to complete. However, when you record the demonstration, Captivate captures the button click and the resulting screen, but does not capture the 7 seconds it took for the process to conclude. In fact, Captivate's Timeline seems to have ignored the processing time altogether. It's a real timing dilemma! As far as I'm concerned, it's a bad idea to capture the 7 second delay between one click and the next. Just because a process takes time, doesn't mean that you have to force your learner to experience the delays. I recently worked with a client who wanted to show the actual delays a user would experience between one click and the next to make the demonstration more realistic. Believe it or not, Captivate does have a little known or used feature that will allow you to record your clicks and the resulting delays that might occur between one screen and the next. Show Captivate's Preferences (Edit menu if you're using Windows; Adobe Captivate menu if you're using a Macintosh). From the Recording group, select Settings and, from the Audio Options, select Actions in Real Time. From now on, recording a 12-minute process will force your eLearning video to play for 12-minutes. A 20-second delay between clicks will result in a 20-second play time for the Captivate slide. Fair warning however... most eLearning videos won't be better by recording Actions in Real Time. In fact, the published videos will be larger and will play longer than necessary. Be sure to go back to the Preferences dialog box and disable the Actions in Real Time option prior to recording if you don't want to use it. Looking to learn Adobe Captivate 5? We are now offering Beginner and Advanced classes, as well as a half-day course on Advanced Actions. Both Windows and Macintosh developers can attend the classes. When you work with PowerPoint frequently, every little tip could help improve your productivity time. A quick Google search will turn up a list of common keyboard shortcuts for working in and presenting with PowerPoint, but here are a few lesser known tips I'd like to share. Every time I upload a new version of PowerPoint, the first thing I do is increase the number of Undos I can make. This never fails to be a huge lifesaver for me. Choose File from the Ribbon and then select Options. Select the Advanced category. From the Editing options area, change the Maximum number of undos to 150 (this is the highest you can go). Setting the number of Undos this high may slow down your system. I don't notice a difference so I always keep it at the maximum number. If you notice your system being sluggish, try lowering this number by half. 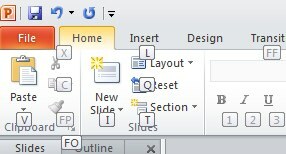 Did you know that most everything in PowerPoint (and in all MS Office products, actually) can be done with keystrokes? With PowerPoint open, press the [Alt] key on your keyboard. Notice that each tab on the ribbon is assigned a letter. The Home tab, for example, is H. Pressing any of the tabs' assigned letters will take you to that tab and reveal more key shortcuts for that tab's commands. Want to change your slide's layout? Press [Alt] [H] [L], use the arrow keys to move between layouts and press [Enter] to make your selection. Audio for eLearning: Do You Want to Sound Like a DJ? One question I get asked a lot is "How can I get my eLearning audio to the point so that I sound like a DJ?" The most sure-fire way to sound like a DJ is to have been born with great pipes (i.e. vocal cords)! But very few of us have been so blessed. So what's an eLearning developer to do? Here's some simple techniques to make your voice sound deeper. Talk more slowly. The faster you talk the higher your voice gets. The slower you talk, the lower it gets. Get intimate with your microphone. That means, get closer to it (maybe one to four inches away). Getting closer will engage what's called the "proximity effect," lower the sound of your voice, and make it sound fuller. But beware, if your breathing is too hard, you'll get popping sounds without a pop-filter as I discussed a few weeks ago. These techniques won't guarantee a job in the radio industry, but they will help you get that sound you're looking for. Have fun playing with mic proximity! About the author: Rick Zanotti is an instructional designer, multimedia author, voice-over talent, video producer and Management consultant with more than 35 years of experience in IT and Learning. He has managed multi-million dollar projects and believes in a simple and practical approach to providing solutions. Rick founded RELATE Corporation 26 years ago, a successful eLearning and media development company. Rick teaches our Audio Basics for eLearning online class. I am the most accurate typist in the world. Want me to prove it? Fine! 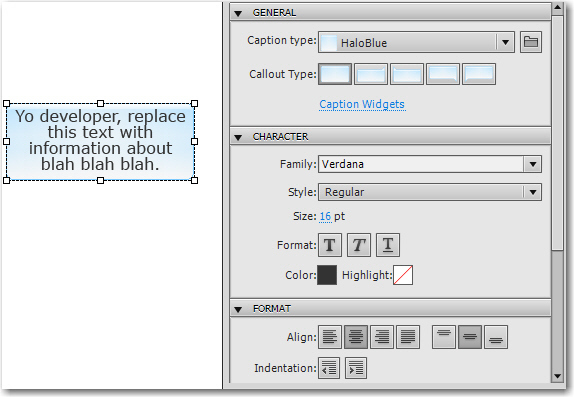 I was recently working on a Captivate project that contained more than 70 text captions. I was the one who both created those text captions and typed the text. Just prior to publishing the project, I ran Captivate's spell check utility by choosing Project > Check Spelling. And you know what? There wasn't a single typographic error on any slide... not a single one. See, that's proof that I am the most excellent typist in the world. I mean, when was the last time you aced the spell checker? Of course, on further review, I realized that my accuracy wasn't so good. There it was, on Slide 2... the word Chicago was spelled Chiccago. Huh? Why oh why would Captivate tease me like that and have me staking a claim to the world's accuracy title? It's a cruel world! 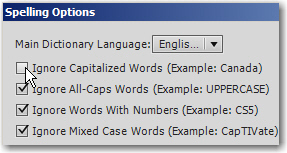 If turns out that Captivate will not spell check words with capitalized letters (such as Chiccago). If you're like me and tend to type with two left hands, then you might want to turn that particular option off. Show Captivate's Preferences (Edit menu if you're using Windows; Adobe Captivate menu if you're using a Mac). Select the Global category and then click the Spelling Preferences button. Deselect Ignore Capitalized Words and click the OK button. Run your spell check again... and prepare to relinquish your title of most accurate typist in the world (I know I did). Find the video you would like to insert into your PowerPoint presentation on YouTube (or any other video site with an Embed code like Vimeo or MetaCafe). From YouTube click the Embed button (found below the video) and copy the code. 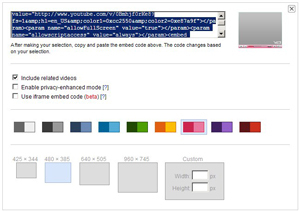 Note: The latest version of YouTube offers Embed options, including video size and playbar colors. If you are going to edit these options, be sure to copy the embed code after you have made these changes, as it will change the code. In PowerPoint, select the slide on which you would like to insert a video and from the ribbon choose Insert > Video > Video from Web Site. Note: Your ribbon may not include the Shape Union and Shape Subtract tools seen above. If you would like to learn how to add (and use) them, check out this blog post. The video will appear on the slide as a black box. Pull the handles at the corners to resize the video to your desired size. When you view the presentation (by pressing [F5] on your keyboard or choosing Slide Show > From Current Slide from the ribbon) the video will appear with its playbar, ready to be played. I was excited to see the option to easily embed YouTube videos added to PowerPoint. Unfortunately I don't think it's quite right yet, as many of the new, fancy video formatting options included with PowerPoint 2010 will not work on embedded YouTube videos. If you would like to insert YouTube videos into your PowerPoint presentation and be able to apply fancy formatting, follow steps 1-9 of these directions. When you have successfully downloaded and converted the video, choose Insert > Video > Video from File from the PowerPoint ribbon. This method takes a bit more work, but you will now be able to apply formatting to the video. There are many ways to create PDFs. If you have Acrobat Professional running on your machine, you have probably discovered that Acrobat's installation process installed a print driver for you. It's called Adobe PDF and can be used to create a PDF file from any application that has print capabilities. Some of you may even use this feature exclusively. Now suppose you are away from your computer and you find yourself at someone else's machine, or you have a PC that does not have Acrobat Professional installed. You need to produce a PDF on the spot, but without your Adobe PDF print driver at hand, you're stuck... or are you? Adobe has added another terrific service to their cloud. It's called CreatePDF and it offers some pretty amazing features. This is not Adobe's first online-PDF creation utility, but it certainly is the most flexible and capable. CreatePDF will allow you to convert many file types to PDF. As useful as this is, it's just the tip of the iceberg. 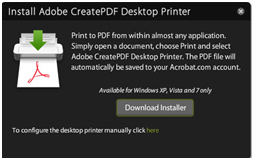 You can convert multiple documents into a single PDF file, and if you're using Windows, you can download and install a special print driver that will allow you to create a PDF file online from any application that can print. All this functionality is available for computers that do not have Acrobat Pro installed. Amazing! Is the service free? Yes... and no. You can convert five files to PDF as a test drive, but the combining multiple files to a single PDF won't be available to you unless you subscribe to the service. The cost to use this service with unlimited conversions is only $9.99 per month. Visit https://createpdf.acrobat.com/welcome.html to give it a try or to subscribe to the service. You can access the tools from your Acrobat.com account too. I believe the monthly fee is more than reasonable if you will be at various computers throughout your work-week, and Acrobat Pro is not always at hand. Remember, you can log in to the service from any machine with web access and a browser! About the author: David R. Mankin is a Certified Technical Trainer, desktop publisher, computer graphic artist, and Web page developer. And if that wasn't enough, of course David is an Adobe-certified expert in Adobe Acrobat. Grammar Workshop: Can I start a Sentence With "This"? When a desperate-sounding student asked me this week why it was incorrect to start a sentence with the word this, I realized I was once again in Bogus Grammar Rule land. This bogus rule was a new one to me, but some editor somewhere was making my student miserable over it. First, let's be clear that the actual rules of grammar, as found in grammar books, do not forbid starting a sentence with the word this. The only possible origin of such a rule is the problem of the unclear antecedent. An unclear antecedent occurs when a pronoun such as this refers back to a vague idea rather than to an actual noun or explicit statement. Some editor or teacher probably took a shortcut to help writers avoid unclear use of the word this by forbidding them from using it at the front of a sentence. Now the editor who was taught the shortcut is enforcing it as though it were a real grammar rule. The actual guidelines for starting a sentence with this are a little more nuanced. Degrees of clarity or confusion can be created, depending on what the word this is referring back to. Clear: The pronoun refers back to an actual noun. Shaky: The pronoun refers to a phrase, clause, or sentence. Unclear: The pronoun refers to a vague idea that is not even stated explicitly in the preceding sentence. The bottom line is that you can start a sentence with the word this. But you do have to make sure its antecedent--the noun or concept it points back to--is clear. Audio for eLearning: Wake Me Up When It's Over! There's are few things worse for a learner than to have to attend a class or take an eLearning course and the narrator speaks in a monotonous, dull tone. Anyone know what I'm talking about? Anyone? Anyone? How do you make your voiceover narration more compelling, engaging and interesting? Practice reading your audio aloud and record yourself doing it. You may feel uncomfortable with this, but it's a time-proven technique that will help you understand the strengths and weaknesses of your voice. Be honest with yourself when evaluating your voice. If you find your reading monotonous or boring, you can rest assured your learners will hate it. Work on your inflection. Ensure that the modulation of your voice includes emotion, emphasis or just plain life. If you can do this, you are 80% of the way there. The remaining 20% is clarity and pronounciation. While these may seem like small things, they will reap huge rewards when done right. And your learners will appreciate it! Over the past few months I've been creating more and more Project Templates for my customers. Some of the most important things you can add to a Project Template are placeholders. What are placeholders? As the name implies, placeholders hold a spot on a slide or within a project for specific objects. For instance, if you always want a Text Animation of the first slide of a project, you can insert a Text Animation Placeholder, set the animation, and other Properties. There are several placeholders you can add to a Project Template including Text Captions, Images, Animation and even Recording Slides. When a Captivate developer creates a new project based on a Project Template, the placeholders will be available for use. And since placeholders retain their predefined Properties, all that a developer needs to do is double-click the placeholder and add the content. The developer does not need to spend time worrying such things as Caption Type, Character Family or Size. While placeholders are great timesavers, there are a few problem. 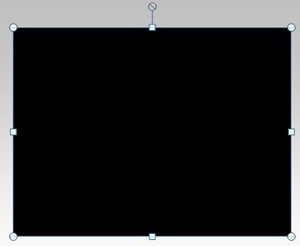 First, when placeholder objects are inserted onto templates slides, they won't be visible when you preview or publish the template. In addition, placeholders have an annoying feature... they aren't WYSIWYG (What You See Is What You Get) when they're created. In fact, the formatting you apply to a placeholder only shows itself once the template is being used by a new project. Let's take a look at the text caption placeholder in the image below. I formatted the caption so that it used the HaloBlue Caption type and the font formatting was set to Verdana, Regular, 16. However, even though the Properties panel verifies my formatting, the placeholder is less than cooperative. In fact, if I didn't know any better, I would assume that the Properties didn't take and I'd try to format the placeholder over and over and over and over again. The formatting won't be WYSIWYG until the template is called into service. If one of your developers were to double-click the placeholders, it would show its true formatting. Since I'm a visual person, I really need to see how something is going to look before I'm comfortable. In short, I really need my WYSIWYG. If you're like me, you'll love this little trick. 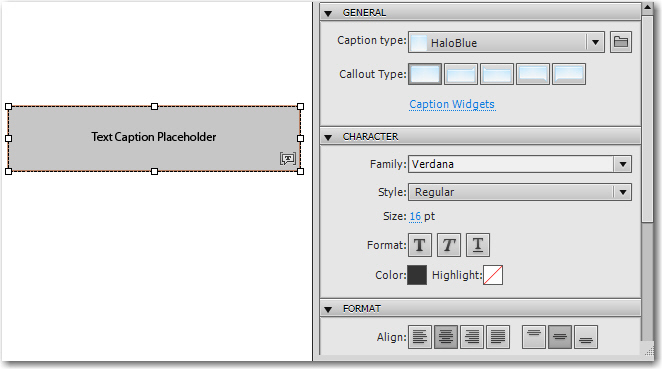 While working in a Project Template (you cannot insert placeholders into a regular Captivate project), insert a standard text caption (not a text caption placeholder). Format the caption as you normally would. In the image below, you can see that I've formatted the caption using the HaloBlue Caption type and the font formatting was set to Verdana, Regular 16. While the appearance of the caption is indeed WYSIWYG, there is a problem. The caption isn't a placeholder so it won't behave like a placeholder once the template is placed into service. So here's the trick... delete the text caption. And BAM! Instead of the caption actually being deleted, the caption converts to a placeholder. The formatting of the placeholder is no longer WYSIWYG but my goal was achieved--I visually confirmed the desired format and left the developer with a placeholder. However, when developers use the template and double-click the placeholder, the formatting will already be set. Cool! Adobe RoboHelp Question of the Week: Can I Export/Import SSLs? I have duplicated and set up a Single Source Layout. Can I export the layout so that I can use it in other projects? There is no direct way to do it within RoboHelp. However, you can do it "behind the scenes." If you don't have experience editing code, I would advise against the following technique since it's pretty easy to trash the file. First, copy the SSL support file from within your project folder and paste it into the new project's folder. The SSL file is called name.ssl (for instance, mycool.ssl). From within the new project folder, open rhlayout.apj file using Notepad. Reopen the RoboHelp project and your new SSL will appear on the SSL pod.